For some reason, it has been several days since I actually cooked anything for this blog. I usually find cooking relaxing, but not lately! I have been so busy that I seem to fall more readily into my pillow than into a pot or pan these past few weeks. Although I haven’t been in the kitchen much since the Christmas holiday, I have been treating myself to a few dining-out indulgences like the downright sinful Bananas Foster cheesecake I had today during lunch. 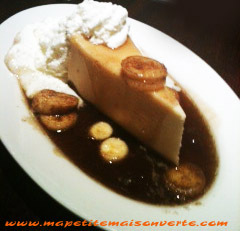 What surprised me most about this Bananas Foster cheesecake (which was just a slice of regular cheesecake topped with caramelized bananas in a warm, rum sauce) was how light it tasted. Of course, I’m not saying that the dessert is light on calories…only that it isn’t a heavy sort of dessert that sticks with you throughout the day. Rather, the cheesecake, sliced fruit, and rum sauce was a delicate and comforting finish to a lovely meal with mon mari. I think it would be fun to incorporate the traditional flavors of Bananas Foster (caramelized bananas, brown sugar, and rum) into any myriad of desserts. I can imagine Bananas Foster ice cream, doughnuts, cake, and perhaps even a pie!